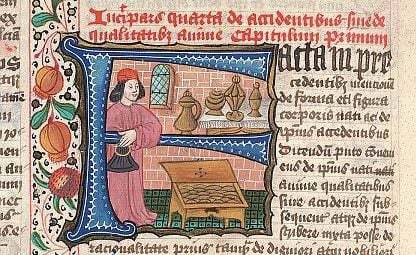 medieval merchant – Detail of historiated initial ‘F'(acta). Abstract: This essay is a study of a Renaissance Italian manuscript which has been published under the title Arte Giamata Aresmetica (‘The Art Called Arithmetic’). This represents a type of mathematical text called Libro d’Abbaco or ‘Abbacus Book’, which was produced in large numbers during the Italian Renaissance (thirteenth to the sixteenth centuries CE). mathematical ability and the mind‐set they had to develop, as well as revealing economic information pertaining to that period (prices, products, and various measuring units). Høyrup and Van Egmond, medieval sources alternate between the spellings abaco, abbaco, and abbacho. Often written in vernacular languages, their emphasis is practical and they explicated what Van Edmond calls ‘business practices’ for Renaissance merchants. Abbacus texts were manuals for teachers’ and merchants’ training. It must be remembered that, before the introduction of the Hindu‐Arabic numbers through Arabic sources, in the West the standard numeration system was based on Roman numerals. Leonardo’s Liber Abaci (1202) is considered among the first Western books to describe the new numerical notation system based on the power of 10, which was immediately conceived of as more practical for calculation. Despite some resistance in the face of this foreign invention and its use of positionality, by the beginning of the fifteenth century the Hindu‐Arabic numerals had made their way through most of the Italian city‐states. In this regard, abbaci played a significant role. In some abbaco works, the decimal place‐value system and the basic arithmetical operations are in fact the first subject treated.